I finished my "Monkey Socks", pattern by Cookie A. This was a great pattern and a lot of fun to knit. So why did it take me since last February to get it done? I've been doing lace projects last spring and all summer and finally needed a break. Well, it's October in Minnesota and I started having cold feet again so finished these up. They are made with the beautiful 70% Merino, 30% Silk Gloss Sock Yarn in the color Porcini. Lovely stuff. When I do socks for myself, I find I generally have enough left over to do a small pair of socks for the kids too. 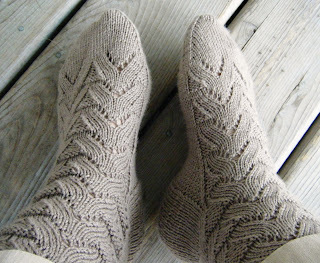 If I do them toe-up I can use all the remaining yarn. I just weigh the ball, divide it in half and off I go. No waste, no danger of running out. 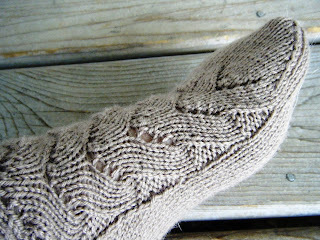 I try to keep my sock knitting low-key as they get pretty excited to have a new hand-knitted pair. Is that weird? I mean, what kind of children get excited by socks? ...Ummm, I guess they take after their mother. Great pictures, Carol. Your front step really looks spooky!!! Your socks are so pretty. This last pair was especially so. Love my knitin' daughter. Those socks are beautiful. My daughter finally finished her first pair and is working on another. I'm really enjoying following your blog. I can't wait to start knitting something more than scarves! Socks...they look a little challenging to me right now. But maybe someday.